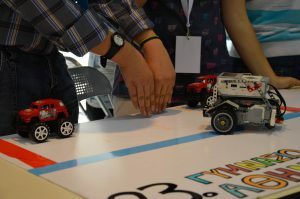 The “Educational Robotics 2016” (EduRobotics 2016) International Conference (former TRTWR) builds on a number of previously and successfully conducted international workshops. The international conference dates back to 2008 where it was first held in Venice in the form of an international workshop in the context of the TERECoP project titled “Teaching Robotics and Teaching With Robotics- TRTWR” Past workshops have successfully carried out in Darmstadt (2010), in Riva del Garda (2012) and in Padua (2014). The publications from the workshops include open online proceedings and 2 special issues in journals: Themes in Science & Technology Education, vol. 6, No1 (2013) guest editors D. Alimisis, M. Moro & Robotics & Autonomous Systems Journal, Jan 2016, guest editors D. Alimisis, M. Moro. The interest in the continuation of the international workshop and the previously successful editions witness the continuously growing interest in educational robotics world-wide and enable the building of a community of researchers and educators with interest in the area of Educational Robotics across EU and beyond. This interest is exploited by the EDUROBOTICS 2016 International Workshop which this year is organised in the framework of the European Robotics Week. The EDUROBOTICS 2016 conference builds on the pedagogical theories of constructivism and constructionism (Piaget, Papert) and this year focuses on “Educational Robotics in the Makers Era”. 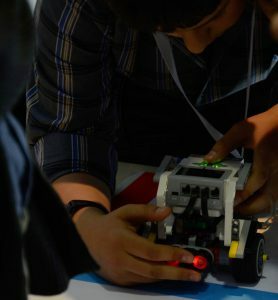 With this as a central theme, the conference aims at positioning educational robotics in the Makers Era, identifying connections with digital fabrication and exploring how educational robotics can support the development of skills in Science, Technology, Engineering Arts and Math as well as creative thinking, collaborative, and problem solving skills – skills that are essential in the workplace of the 21st century. Participants will be given the opportunity to attend also the ROBOESL conference (Robotics-based learning interventions for preventing school failure and early school leaving) that will be held on November 26, 2016 in the context of the ROBOESL project (ERASMUS+ 2015-17 www.roboesl.eu). We cordially invite academics, researchers and educators active in the field of educational robotics at all levels of education (primary, secondary and tertiary), including young researchers, PhD and post-graduate students to submit their papers or posters.